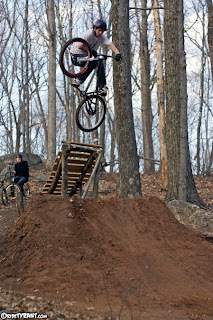 We hit up Chad's Trails yesterday and they've been rebuilt in the past 6 months since we were last there. The line is tighter and smaller than it was before, but crazy flowy and fun. Rumor has it things will begin to get built up more and more as the weather get nicer. Steve manned up and was giving it hell on the mountain bike bridge drop. Good times for sure...and the trails are only 10 minutes from my doorstep!